In this article, we explain how to install Drupal on a VPS with DirectAdmin. Paid options such as Installatron or Softaculous can simplify the installation and allow you to execute from DirectAdmin with one click. We assume that you do not want to incur additional costs or want to install additional software, and only explain how to install Drupal in DirectAdmin using the built-in options in DirectAdmin itself. Download Drupal from the Drupal homepage and save the .zip file to your computer. 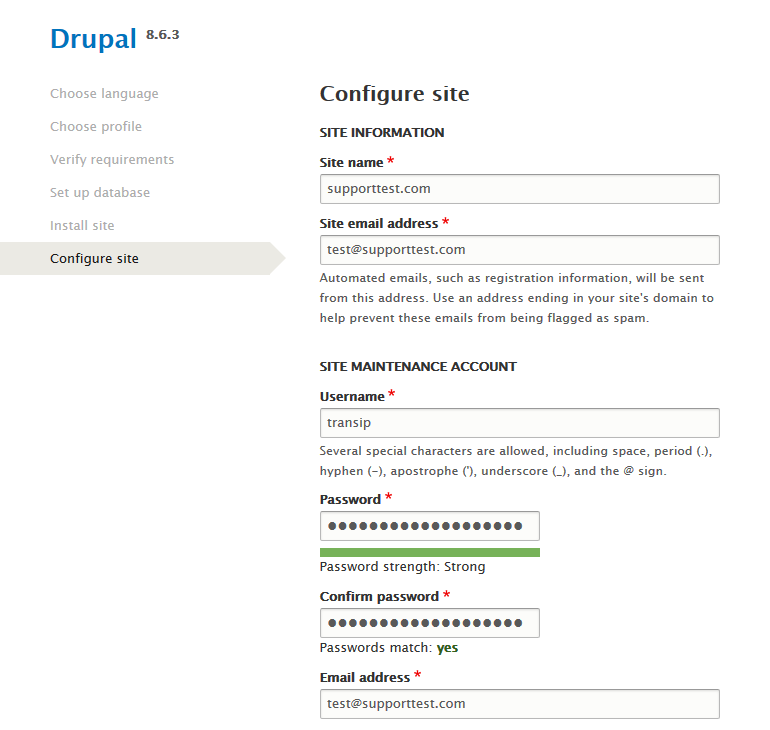 Log in to DirectAdmin as the user for which you want to install Drupal and click 'Files'. Do you want to use a subdomain? 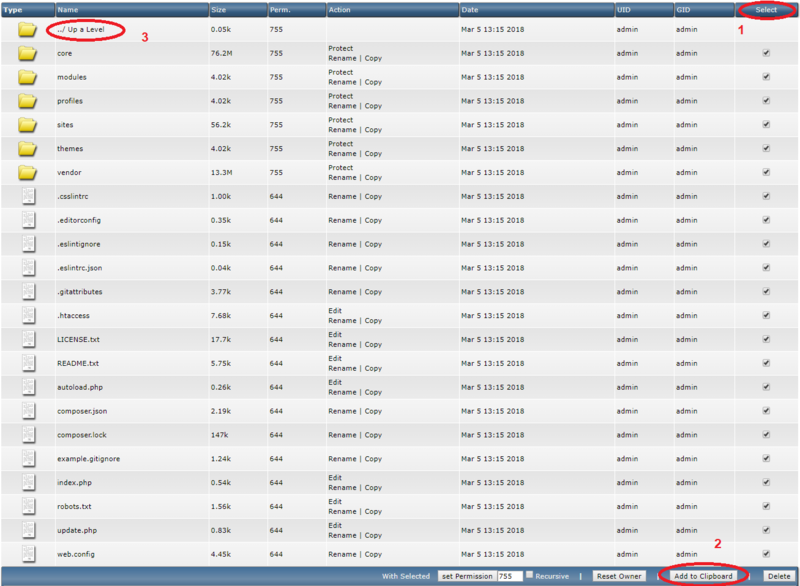 Then click the folder with the name of your subdomain. Click 'Upload files to current directory'. You will now return to the public_html folder and you will see 'drupal-8.4.5.zip' (or the version that is current at the time of reading). Click 'Extract'. You will see an overview of the content which is going to be unpacked and you can change your folder under 'Directory' (do not do that). Click 'Extract' again to start the unpacking process. 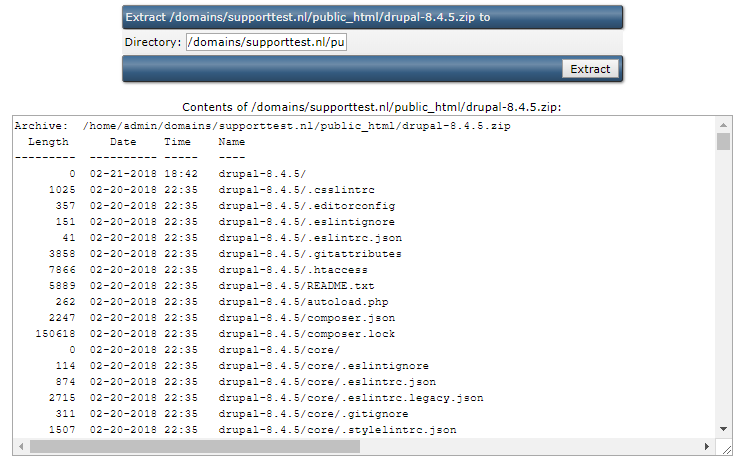 Drupal puts its files in the 'drupal-4.8.5' folder in the .zip file you downloaded. As a result, there is a new folder in your public_html folder called "drupal-4.8.5". Click 'drupal-4.8.5' to open the folder. Click 'Select' > 'Add to clipboard' > '../ Up a Level' successively. You have now selected all files and folders in the Drupal folder and prepared them to move. Click 'Move Clipboard Files here' at the bottom right. You will be asked whether existing files may be overwritten. Click 'OK'; without all files, your Drupal site would not work. Remove the Drupal-4.8.5 folder and the .zip file by checking them and clicking 'Delete'. Open yourdomain.com in a browser (replace yourdomain.com by your actual domain name). You will then see the Joomla setup menu. Select your preferred language and click 'Save and continue'. You can then choose a 'Standard' or 'Minimal' installation. Choose 'Standard' and click 'Save and continue'. Drupal checks whether your VPS meets the requirements for the installation. 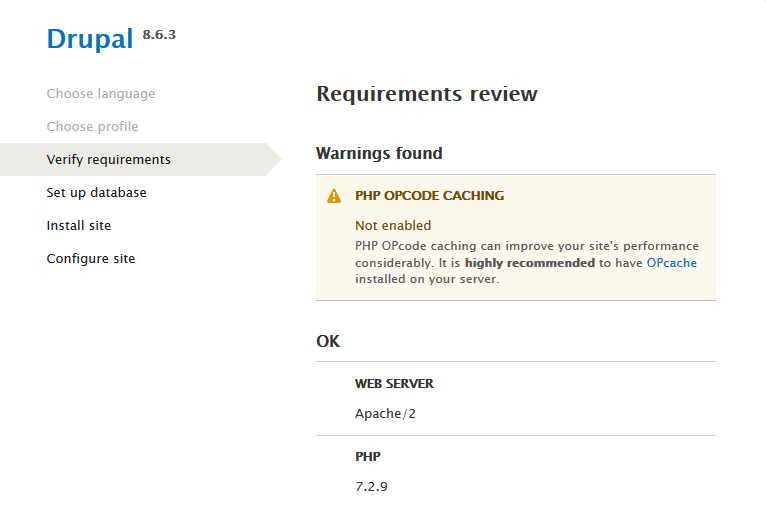 You will see a warning about OPcache. Click 'continue anyway' at the bottom. You are free to enable OPcache after the installation, but the configuration of this falls outside the scope of this article. A database is required for this step. In our DirectAdmin tutorial series, we explain how to create a database. 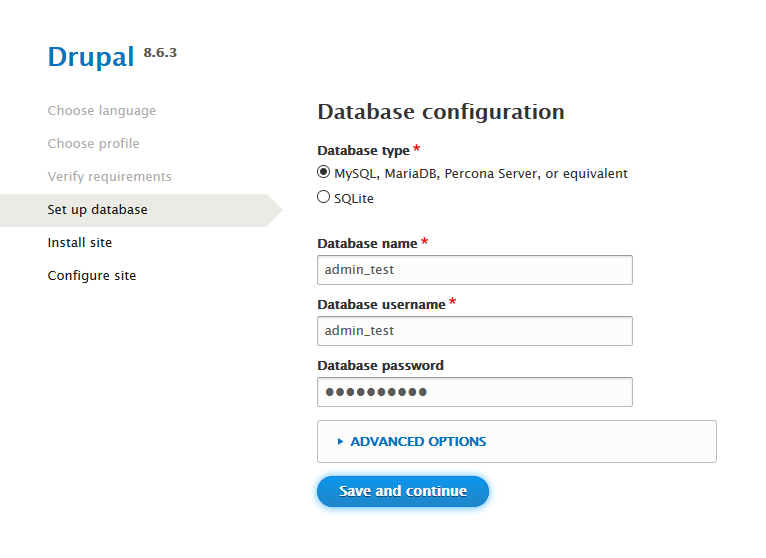 Enter your database as in the example below and click 'Save and continue'. 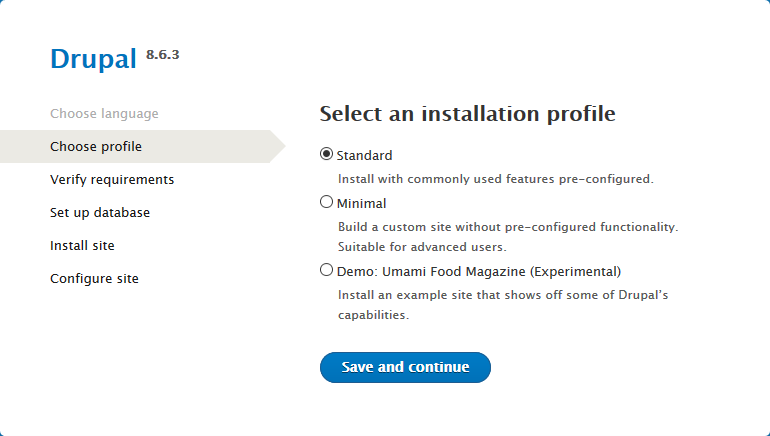 Drupal automatically installs your website and automatically proceeds on to thenest step (19) afterward. Drupal then asks you for the information below. Complete the fields, write down your username and password should you lose them, and click 'Save and continue'. After completing this process, you automatically go to your Drupal site and you can start setting up your site! Please note that we cannot offer support on the design and management of a Drupal website ourselves.